2nd quarter 1979- issued jointly with the Bureau of Industrial Economics. Vols. for 1987- issued jointly with the Bureau of Domestic Business Development. Copper-base mills and foundry products. products, and a 95 percent sample of producers of wire mill issued July 1984. Note: Detail may not add to totals due to independent rounding. (NA) Not available. (X) Not applicable. 2Represents copper content weight, rather than metal weight. 3Represents uninsulated, bare, tinned, and/or alloy coated wire. 3Source: Bureau of the Census, Current Industrial Report M33E, Nonferrous Castings. Beginning with the first quarter 1984 copper-base powder mill products will no longer be collected. Bureau of the Census, Industry Division, Washington, D.C. 20233, or call Jim Oliver, (301) 763-5440. For sale by the Superintendent of Documents, U.S. Government Printing Office, Washington, D.C. 20402.
webbing scrap generated in the cupping and discing. 2Does not include electrical wire. 3Reported in copper content weight rather than metal weight. 4Represents uninsulated, bare, tinned, and/or alloy coated wire. 5Source: Bureau of the Census, Current Industrial Report M33E, Nonferrous Castings. 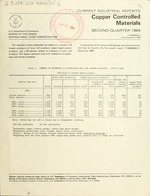 the2first quarter 1984 report, ITA9008(84)-1, issued July 1984. 3Source: Bureau of the Census report EM 546, U.S. Exports. products) are based on data for 1981 which are published in Origin of Exports of Manufactured Products, M81(AS)-5, appendix B. 6Represents the c.i.f. (cost, insurance, and freight) a, i-, rir.. r ,-. r ,.rr r .:.r,- r.- rted States plus U.S. import duties. 7Apparent consumption is derived by subtracting exports from the total of net shipments plus imports. This total does not include either insulated wire and cable or brass and bronze foundry products.